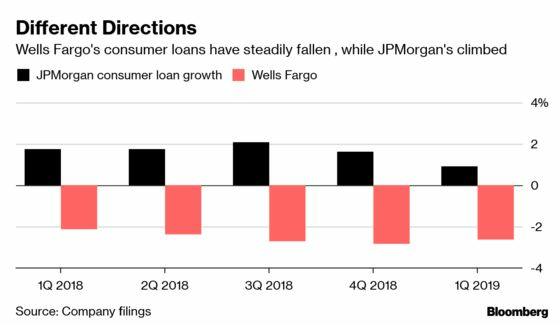 (Bloomberg) -- JPMorgan Chase & Co. and Wells Fargo & Co. have long been locked in a fierce race to serve U.S. consumers. One is pulling ahead. The gap in performance is set to widen further in the months ahead. As they both reported quarterly earnings on Friday, Wells Fargo said companywide net interest income could drop as much as 5 percent this year. JPMorgan has predicted a jump of at least 5 percent for its comparable figure. Wells Fargo’s stock slipped 2.6 percent on Friday while JPMorgan’s jumped 4.7 percent -- the most in three years. 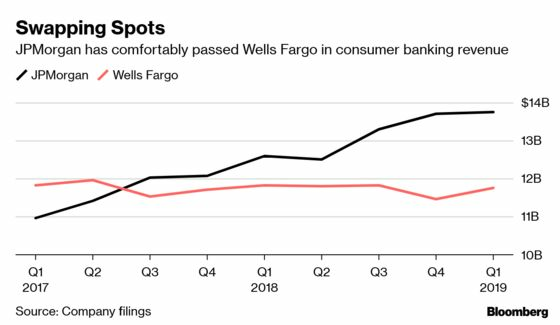 For years, Wells Fargo drove growth by pressing branch employees to sell more products to every customer, at times employing a slogan “Eight is Great.” The bank was forced to re-tool incentives and ease off quotas in the wake of its scandals and now faces a new problem: It’s been sliding behind major peers in revenue per employee. It has the largest workforce of any U.S. bank, with 262,100 people at the end of the first quarter. Headcount increased by 3,400 during the period.